Car accidents are dangerous enough, but when they involve a large commercial vehicle they are often deadly. Over 7 percent of auto accidents in 2016 involved 18-wheelers, tractor-trailers, or semi-trucks. This equates to roughly 547,000 large commercial vehicle accidents. A tractor-trailer is a vehicle that consists of a towing engine and a semi trailer that carries the freight. They are often referred to as 18 wheeler truck, semi truck, or big rigs. In order to be considered a semi truck, the truck must have a minimum 10,000 lbs of gross weight and a maximum of 80,000 lbs gross weight. The heavier the load the trucker is driving, the more difficult the truck is to stop. The heavier load will also cause greater damage in an auto accident. Many experienced truck drivers are paid by the numbers of miles they travel, leading some drivers to drive more and not get enough sleep. The Federal Motor Carrier Safety Administration (FMCSA) has recently ruled that truckers can drive as many as 11 hours at a time, but then must take at least 2 hours off. If a trucker is speeding he or she is driving recklessly. Stopping a truck becomes much more difficult the faster it is being driven. Some truckers have a negligent attitude and believe that drivers should yield to them because of the truck’s massive size. Unfortunately, this is not always possible and is not reasonable to assume. A truck must be properly maintained. Even if the best driver is driving, it takes one small part to fail to cause an accident. While drivers are trained on how to avoid blind spots, most mirror systems do not allow a full view of the area behind them. The loud engine of the truck can also drown out the honks or noise from concerned drivers. Highway Hypnosis is a trance-like state that can occur after a driver watches the same or similar monotonous road scenery for an extended period of time. This can cause the driver to zone out and fail to register details that defensive drivers must acknowledge to prevent an accident. An accident often has a number of contributing factors. The manufacturer of the car or commercial vehicle could have provided a defective design or product. Road construction crews sometimes fail to provide appropriate notice of construction or hazards, which can lead to collisions. The driver could have falsified the logbook and driven more than the legal amount of time and the trucking company may not have properly monitored the driver. Before a lawsuit is filed, it is important to conduct an investigation to determine all of the responsible parties. Accidents involving commercial vehicles are often devastating and deadly. It is important to contact an attorney that has experience in handling commercial vehicle cases. 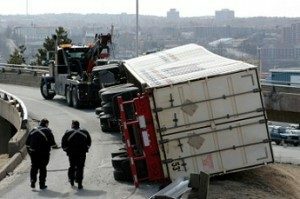 Trucking accidents can leave the victims with medical bills, emotional trauma, loss of income, and physical damage. Let Powers Taylor help. Our attorneys have experience with all types of auto accident cases and will fight to get you the justice you deserve. If you or a loved one has been injured in an accident with a commercial vehicle contact us today for a free consultation. All calls are confidential.